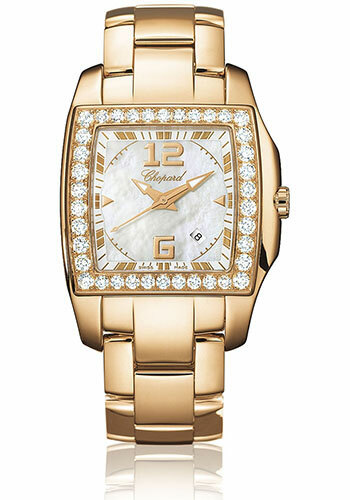 34.8mm x 28.9mm 18K rose gold case set with diamonds, white mother of pearl dial, quartz movement, 18K rose gold bracelet. Water resistant to 30 meters. 34.8mm x 28.9mm stainless steel and 18K white gold case set with diamonds, black dial, quartz movement, stainless steel and 18K white gold bracelet. Water resistant to 30 meters. 34.8mm x 28.9mm stainless steel and 18K rose gold case set with diamonds, white mother of pearl dial, quartz movement, stainless steel and 18K rose gold bracelet. Water resistant to 30 meters. 34.8mm x 28.9mm 18K rose gold case, black dial, quartz movement, 18K rose gold bracelet. Water resistant to 30 meters. 34.8mm x 28.9mm stainless steel case, black dial, quartz movement, stainless steel bracelet. Water resistant to 30 meters. 34.8mm x 28.9mm stainless steel and 18K rose gold case, white dial, quartz movement, stainless steel and 18K rose gold bracelet. Water resistant to 30 meters. 34.8mm x 28.9mm 18K rose gold case, white dial, quartz movement, leather strap. Water resistant to 30 meters. 34.8mm x 28.9mm stainless steel case, white dial, quartz movement, leather strap. Water resistant to 30 meters. 34.8mm x 28.9mm 18K rose gold case set with diamonds, black dial, quartz movement, leather strap. Water resistant to 30 meters. 34.8mm x 28.9mm stainless steel and 18K white gold case set with diamonds, black dial, quartz movement, leather strap. Water resistant to 30 meters. 34.8mm x 28.9mm stainless steel and 18K rose gold case set with diamonds, black dial, quartz movement, leather strap. Water resistant to 30 meters.